Half Term: What a wonderful invention – the school run, the playground noise – the incessant meetings, and the huge swell in local population is suddenly suspended for a week or so. Prices rocket if you want to go anywhere, but here at St Bede’s it is quiet. We pray that our staff and pupils all have a good rest so as to be ready to come back refreshed and full of zeal. St Bede's Youth Club: Every Sunday after 6pm Mass. Open to all those aged 10 years and over. Monday 27th 12noon: Carmell Davis. 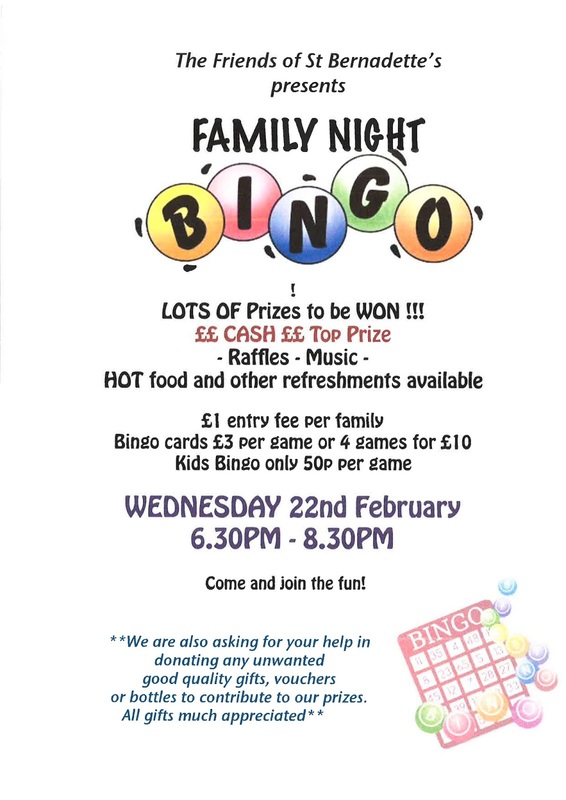 Family Bingo at St Bernadette's School: The Friends of St Bernadette’s are holding a family bingo night on Wednesday 22nd February 6.30-8.30pm. Come and join the fun! 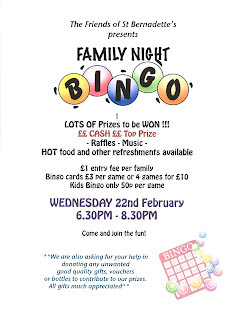 £1 entry fee per family. Hot food and other refreshments available. Raffles & Music. Bingo cards £3 per game or 4 games for £10. Kids bingo only 50p per game. See poster for more details. Donations of prizes will be gratefully received. St Patrick's Night - 18th March: Following on from the wonderful ‘St Patrick’s nights’ run by Mick & Giselle Cronin over the last couple of years – they hope to repeat it all again this year. Put the date in your diaries!! More details to follow. February: Monday 13th - Friday 17th: Half Term. Monday 13th: Altar Servers Day Out. Sunday 19th: 11am ‘Special Sunday’. March: Wednesday 1st: Ash Wednesday. April: Sunday 9th - Sunday 16th: Holy Week & Easter. July: Sunday 2nd: 12.30pm Confirmations. Confirmation Application forms for 2017 Programme: : If you haven’t pick up a form please do so ASAP as we hope to start the programme soon. The Bishop will come on Sunday 2nd July at 12.30pm Mass. Cleaners for this week: Annie Nongo, Biannie Bilwala & Mamie Bazakana. Altar Servers Day out: tomorrow (Monday). We will go to Westminster Cathedral, Quasar Elite in Bromley where we will meet up with Fr Stephen Boyle and his Altar Servers. 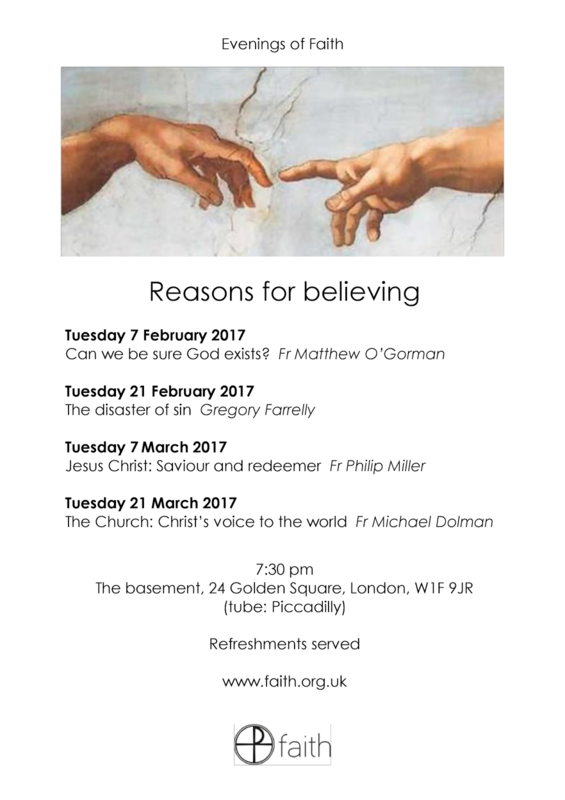 Meet Fr Chris & Fr Pawel at Clapham South by 9.30am and we aim to return by 5pm.